Esna, which we reached next day, detained us for some hours. The Reis and sailors went into town to obtain provisions, and we had great difficulty in getting them together. There were, in fact, potent attractions on shore, Esna being the head quarters of the banished dancing-girls, who flaunt about the bazaars with loose, immodest dresses, and dusky cheeks thickly covered with paint. 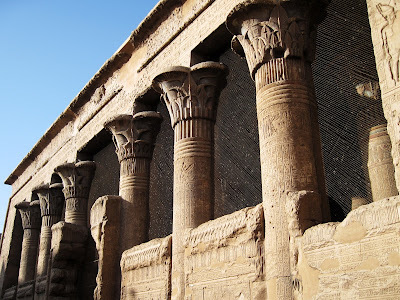 The portico of the Temple of Esna struck us as the most magnificent specimen of the Ptolemaic style in Egypt. The earth has almost covered the exterior, although Mehemet Ali has cleared out the inside, into which you, accordingly, have to descend. The columns are unusually tall and slender, and the exquisite variety and graceful designs of the capitals, all formed upon the type of different plants and flowers of the country, is no where surpassed, if equalled. Esna is a town of some little consequence, but, like Nile towns in general, presents nothing to interest the traveller beyond this splendid portico, and as soon as we could drive on board our reluctant sailors, we spread our sails and hastened up the Nile River.